One last epiphany this evening. Whilst researching Biro Do Cavaco, I found his website. At the bottom of his video page was a clip of a tutorial video. He opens it by playing Girl from Ipanema on cavaquinho. Of course it should be played on cavaquinho! My wife loves that song. She’s FaceTimed me from Ipanema beach singing it. I’m not going to tell her but I have to learn to play it. Learnt the strum and the chords from the video lesson that I’d picked up on previously. The guy on the video is singing a tune over the top but there aren’t any obvious clues with the YouTube clip what the song is. So I Googled the chord sequence and the first hit was a link to the lyrics and chords all in Brazilian Portuguese of course. There was a video on the page and sure enough that was it. I was really pleased to discover that this wasn’t just a chord sequence I’d learned but a proper song. This feels like a real development. I like it when learning something new. You go through a period of messing about blindly, not really understanding what you are doing. Sometimes that’s helpful but often you need to get some of the basics down first. With this cavaquinho, whilst I could strum a few chords to songs I already knew, that didn’t seem like progress somehow. Tonight though, has been one of those pivotal “aha! I get it now” moments. I made myself a handy chart of what the notes on each string at each fret are. These tuning pegs have two holes in. Not really sure why. I did have a bit of a Google but wasn’t able to find anything to indicate why. I’ve restrung the new strings with the outer D strings through the outer holes and the G and B strings on the inner holes. In each case I’ve looped the spare through the other hole before cutting it off but that seems a bit redundant as it’s not under tension there. It all looks a bit tidier now though so hopefully less string breaks. For the moment I’m focussing on the first half of this clip. The second half gets a bit more intense and I’ll come back to it later. The title Curso Pratico Samba e Pagode translates as Ongoing Practice Samba and Pagode. Pagode is a style of Brazilian music, a subset of samba. I can form the chords. I need to build up to making the changes cleanly and at the speed he’s playing it. I don’t know what the song or tune he’s singing over the top of this is. I’m just using this as a simple starting exercise to get some chord changes and a strum pattern locked in. Update: worth adding and pointing out that I now know what the song is that this chord sequence belongs to. It’s called Jéssica by Biro Do Cavaco. If I’m going to learn to play this cavaquinho properly I ought to get an idea of what sort of music gets played on it in Brazil. I’m currently reading How Music Works by David Byrne. In it he mentions Brazilian music when refering to his world music label, Luaka Bop. This is something I had been aware of previously but it wasn’t relevant to my interests then. This time though my interest was piqued by this passing mention and has had me investigating his Brazil Classics series this week. Some of the albums focus on Tropicália, a kind of 60s counter-culture rock music fused with afro-latin rhythms. I’ve heard some of this earlier this year from Caetano Veloso and Os Mutantes whilst working my way through the 1001 Albums You Should Listen To Before You Die. Bossa Nova and Samba were quite popular in the 60s and I’ve also been exposed to Stan Getz, João Gilberto, Astrud Gilberto and Antonio Carlos Jobim through this project. Brazil Classics 2 O Samba seems the most relevant to this. 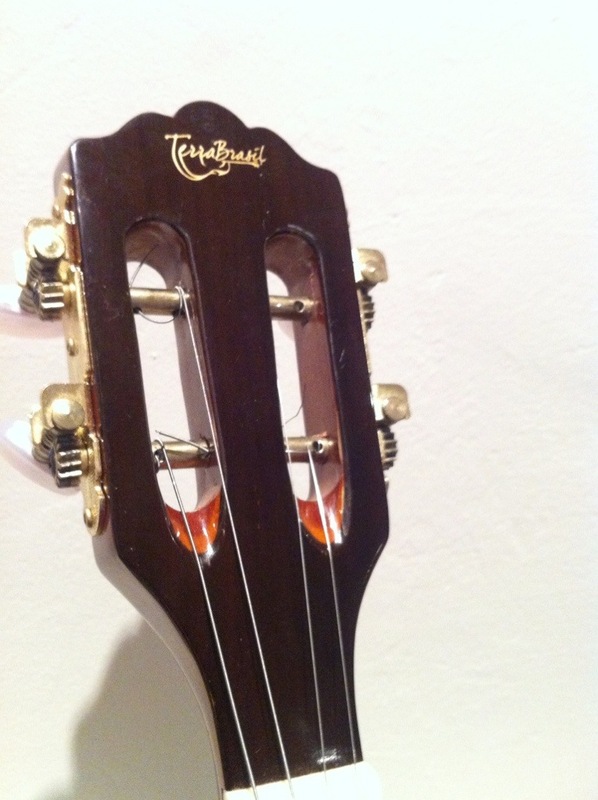 The cavaquinho can clearly be heard providing the rhythm backing on many tracks. I need to learn those sort of strum patterns now. Listening to Brazil Classics 2, I was excited to hear the cavaquinho on Ela Nao Gosta De Mim by Agepe accompanied by the distictive sound of the cuica – a percusion instrument that sounds like somebody punching a monkey. The cuica is actually a friction drum. You’ll probably have heard a cuica before on songs like Me and Julio Down by the Old Schoolyard by Paul Simon. Gotta love a cuica. I have a cavaquinho and I’m not really sure how to use it. Last year my wife bought me a cavaquinho for my birthday. She bought it in Brazil whilst on business there. I’m not sure she knew quite what it was but it looked a bit like a uke and stringed instruments are kinda my thing. It was evidently a decent instrument that she’d bought from a proper music shop. a Portuguese instrument that the Hawaiian ukulele is descended from. I managed to find out from Wikipedia what it was tuned to – DGBD which is the same as the full length strings of a 5 string banjo and found some chords on the Internet. It’s an open G tuning. Strum all open strings. That’s a G chord. 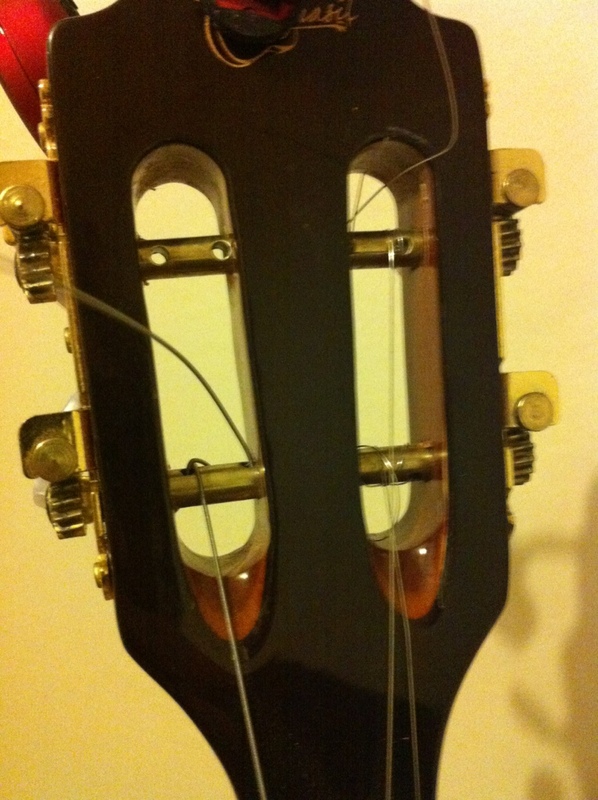 Then I broke a string which put paid to much more. 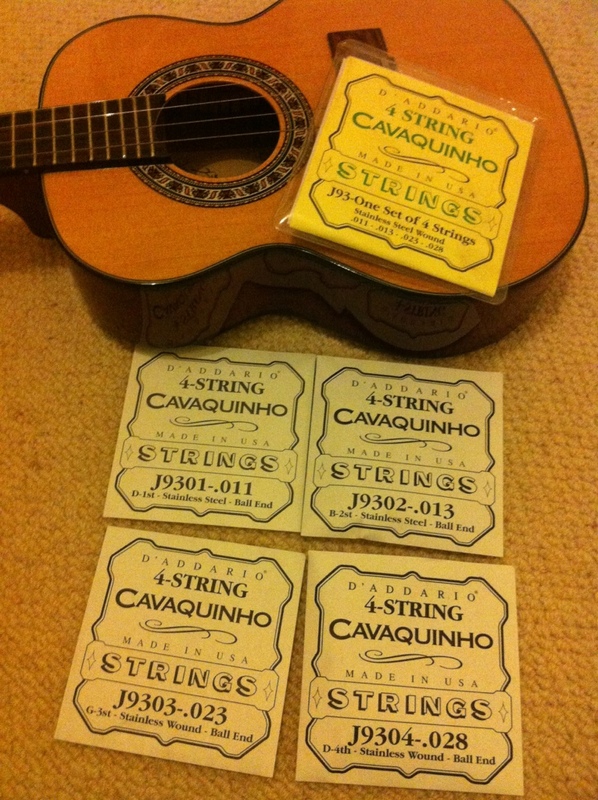 You can’t just pick up a set of cavaquinho strings in your local music store. Not even Hobgoblin had them in stock. As it was the same size and scale length as a concert uke I replaced the steel strings with a set of Aquila Nylgut strings and tuned it as a uke. It was a bit odd to play as the neck is narrower than a uke, narrow like a mandolin so chords felt cramped. Also it’s made to take steel strings and the body is braced for strength so the Nylguts never really got the soundboard moving enough. It sounded quiet and weak. So I went back to steel strings using a soar mandolin string of suitable gauge in place of the broken one, and tried to find out more about the cavaquinho and learn to play it properly. Trouble is, most of the resources are in Brazilian Portugese. I’m not really any good with languages and even though i bought my wife, who is some books and CDs to teach herself, thst’s not really going to help me understand websites and youtube clips. There are very few resources in English. 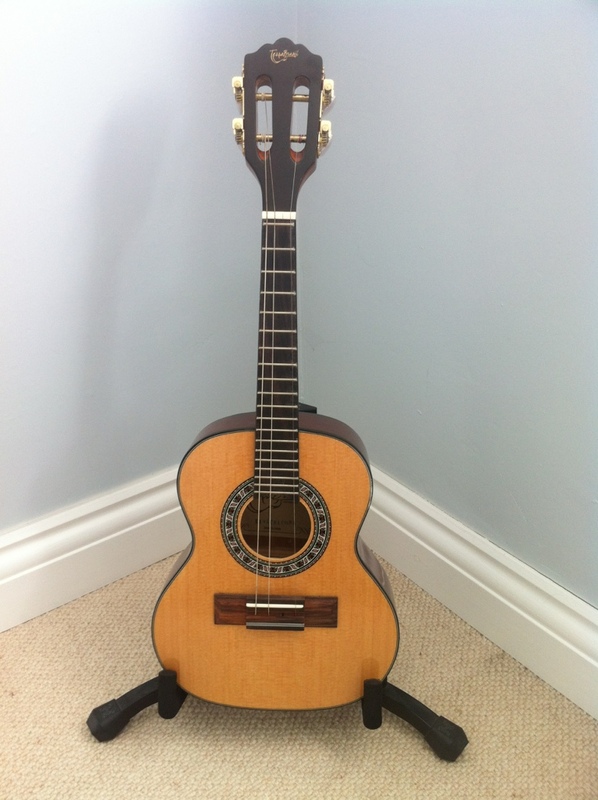 So the cavaquinho has sat around looking nice for a few months but I really want to have a go at learning to play it. So that’s the point of this blog. To capture what I find which may help any other English cavaquinho players out there get stated. Think it’s possibly a niche instrument and there may only be a handful of other people in the UK with one but please do get in touch if you’re either in similar circumstances or even an expert who can share their wisdom.